The information herein is based upon and drawn from sources that are currently available. With the passage of time, and more records and archives becoming available, the information may be corrected and updated. The club has always been known as the Mounteney Jephson Rifle Club in Fittleworth. After the death of Captain Mounteney Jephson in 1908, the word “Memorial” was entered after his name. As time went by, and the club won cups, trophies and shields, the club became more widely known as the “Fittleworth Rifle Club”. The reasons for this were two fold, firstly, the engravers had trouble spelling Mounteney-Jephson, and secondly, the full title with the added “Memorial” took up rather a lot of room or would not fit in the space available. In 1902, Captain Arthur Jermy Mounteney Jephson, paid to have an old sandpit at Hesworth common, that the village used as a rubbish tip, cleared, and an indoor 25 yard rifle range erected. The club appears to have been set up primarily for Capt. Mounteney Jephson and a group of like-minded friends and associates. Capitol expenditure was met in the early days by the founder himself. Likewise, in the beginning, ‘Capt. Mounteney Jephson was the committee, with General Sir Ivor Maxse, de facto president. With the formation of a committee, the General remained president until his death. In 1904, Lord Frederick Sleigh Roberts, 1st Earl of Kandahar (1832-1914), gave a speech at the shooting fields at Bisley. This speech later became known as the “Bisley Address”. Lord Roberts had been spurred into action after his experiences in the second Boer war, and the ability of the Boers to not only shoot quickly but also with deadly accuracy. In his speech Lord Roberts asked for the general population to receive training in military practices and rifle shooting. With this speech (I have no doubts) in his mind and a strong patriotic sense of responsibility, Capt. 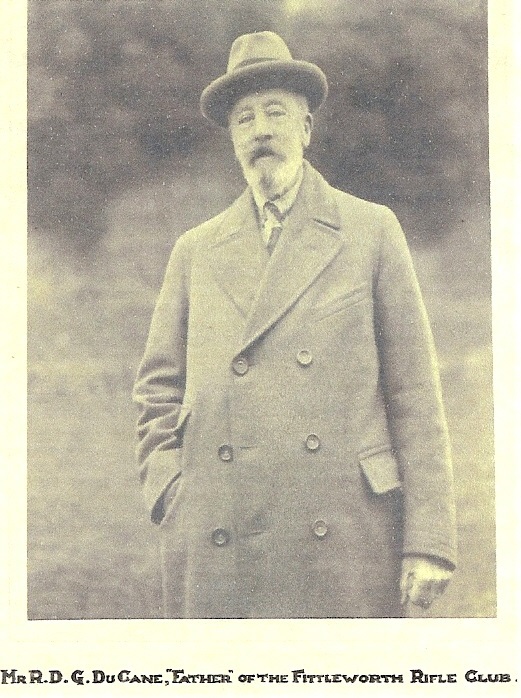 Mounteney Jephson and his wife instituted and maintained, “…the most flourishing village rifle club I have yet come across”, said Sir Ivor Maxse. To which end, the club was joined to the “Society for Miniature Rifle Clubs” in 1908. This was later (1947) to become the “National Small-bore Rifle Association”. The period from the end of the “Great War” through to the mid 1920’s, saw the club under the stewardship of such local dignitaries as General Sir Ivor Maxse, and Mr Dacre DuCane. The latter devoting great time and ability to the welfare of the club, with the result that during the winter of 1924-25, on two or more days a week, 12-20 men and boys from the village would turn out to shoot on the well-lighted range. The between the war years were good for the club, and it carried on and produced many local, county and national winning teams. One of the better shots, and a local celebrity was one George Attrill, who history recounts as the range warden for many years. Tales of Georges legendary marksmanship were not only limited to a rifle, but also a crossbow and a catapult. The Second World War came and went, and afterwards the club went back to shooting, but now the club had another asset. The outdoor military range at Lisgate common. Thanks to a long connection with the Barttelot family, the Stopham estate allowed the club to take over the range; this gave us 25, 50 and 100 yard shooting distances. However, the 25 yard range has been dismantled, as a road now runs behind what were the butts. This still left us with the 50 yard range, which was adjusted to 50 metres after the storm of 1987, when the firing point was destroyed by the hurricane along with the 100 yard butts. Both were re-built, and apart from required maintenance, are still standing and in constant use throughout the year. The Barttelot family has been present through virtually the whole life of the club. Our present president is Sir Brian Barttelot, his late father, Sir Walter Barttelot, was vice president between the wars, and Sir Brian’s great-grand-mother, presented cup in the memory of her late husband, also Sir Walter, killed in the battle the river Modder in 1899. Unfortunately when taking over, this was one of the items which had disappeared over the years. Even before this, the connection between Mounteney Jephson and the Barttelot family was there, as Mounteney Jephson, a lieutenant at the time, accompanied Major Edmund Barttelot on H. M. Stanley’s, Emin pasha relief expedition from 1887-1889. There is little doubt that during the 50 years from the end of the Second World War, the club thrived, and whilst we have a large amount of financial documentation, the everyday members, and their achievements have been lost to time. To give some idea of how well the club was doing, in 1968, the club held its Diamond jubilee, and contained within a menu where some notes for a speech to be delivered. 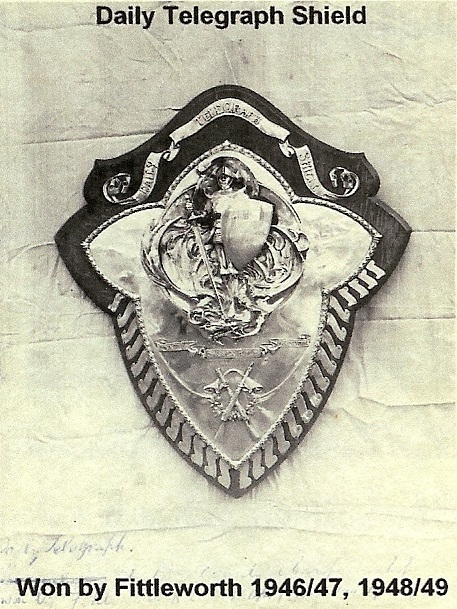 In the notes is the following, “…at present Fittleworth have 5 teams in the Sussex county leagues, 4 teams in the West Sussex leagues, 2 teams in the National leagues, and a ladies team in the National ladies league.” Notables mentioned were W. W. Medlock, club champion, A. D. Hammond, D. Corden, and N. Whittington. ; among the ladies were Mrs. Medlock, Mrs. Knox and Mrs. Pill. Throughout the history of the club is a great sense of family and belonging, this was a tradition carried on with the induction of Mr. Denis Corden to the position of honorary secretary. His father, A. V. (Victor) Corden, had been secretary and a long standing member, and now Denis was to start his long and very organised turn at the helm of the club, this was first of two occasions that Denis would hold the position, 1968-74 and 1982-88. In the intervening years the position was held by N. (Norman) Whittington, this did not however mean that Denis was not actively involved in the management of the club, far from it. After a small break Denis elected to treasurer of the club from 1976-81. Due to his thoroughness and conscientiousness, along with that of Mr. Whittington, it is the main reason we have what little history we do regarding the club. Mr. Corden was a good shot and won many competitions, and although no longer active within the club, he stays in contact with the sport by remaining one of scores for the County competitions. Fittleworth has always encouraged junior members throughout the years. During the 1990’s Fittleworth had three junior members who enjoyed their sport so much, that with coaching within the club, they were able to progress to shooting for their county in national competitions, and with further coaching from the experts at Bisley were prospective, or members of, the national junior team. Martin Pennington achieved probably the highest position in a national team, but is closely followed by Elizabeth “Sid” Davis, who won more women’s competitions at an earlier age than any other lady shooter at the time. Richard Addy was also chosen to shoot for the national junior squad. However, these days work and education put such demands on upon youngsters that priorities dictate shooting takes a back seat at such a high level. Whilst the latter two members have relinquished their positions in their squads, hopefully they will return as senior team members and carry on their success for many years to come. After Mr. D, Corden had relinquished the office, the position was filled by Mr. A. Burley. Mr. Burley was, ostensibly a pistol shooter who also shot rifle. 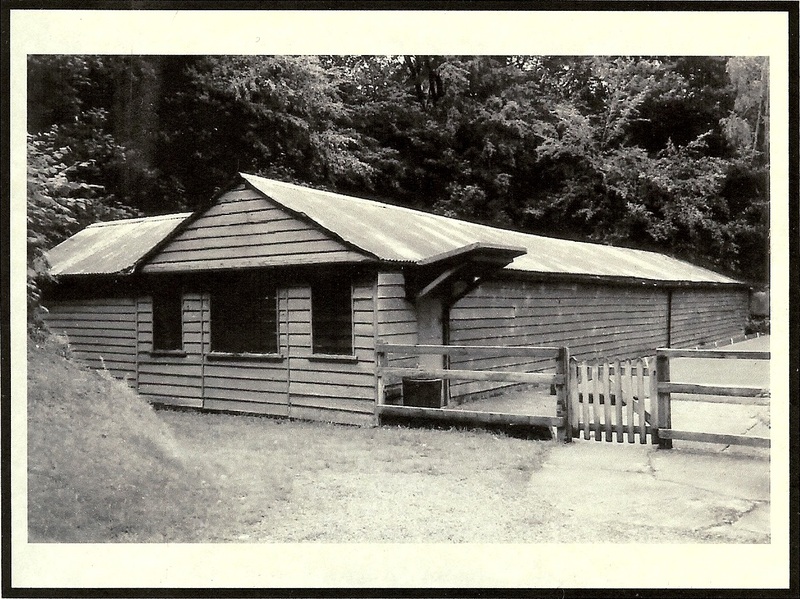 Mr. Burley oversaw the amalgamation of Fittleworth rifle club with that of Worthing P.S.K. whilst P.S.K. brought money and new members to the club, it alienated many of the older members of Fittleworth. P.S.K outnumbered Fittleworth members by over 2:1. The new club was no longer a village club, and eventually no-one from the village was a member. The became a venue, but was not seen as an asset to the village, slowly the building fell into disrepair; cold, damp and leaking from the roof and around the walls where the planking had started to rot, the building was becoming an eyesore. Two events in the latter half of the 2oth century played a large part in the further demise of the club. The first, the mass shooting one afternoon in the town of Hungerford. This brought shooting to the attention of the media, who up until now were quite benign to the sport. This made politicians edgy, so they looked into ways clubs and firearms as a whole were administered. Laws were passed, not too stringent at present, to pacify the media. All was well until the mass shooting at a primary school in Dunblane; again the press were out in force. But this time there was a small but vociferous group of abolitionists with a platform to work from; and in 1997 laws were passed for the total removal of all handguns in the U.K. the channel islands and northern Ireland were exempt as they are crown dependency’s and not subject to U.K law. Unfortunately with the removal of the pistol shooters and a regrettable series of personal illness suffered by Mr. Burley, the club took a further lurch down the hill. After all the pistol shooters had handed in their guns, and the moaners had left, due to the condition of the range, still safe, but very cold and wet, there were three last hopes for the club. Mr. C. Davis, a.k.a. “big Colin”, and the team of Mr. R. (Bob) ide and Mrs. B. (Bab’s) Ide. Mr. Davis undertook, in his own time and at his own expense the re-painting of the exterior of the range. Mr. Ide, whilst having access to the range, had no access to the funding, and purchased ammunition from his own pocket for the reaming members of the club. In the meantime Mrs. Ide kept trying to contact the incumbent committee, to no avail. After nearly 3 years an extraordinary meeting was convened and the old committee removed from office. One problem was that the club membership was in such a state that filling all the posts available was a little awkward. So those with less demanding roles within the club took on another role. The position of president remained with Sir Brian Barttelot, the chairman was Mr. R. Ide, vice-chairman Mr. Mike King, honorary treasurer Mr. C. Cleaver, a.k.a. “little Colin”, and honorary secretary Mr. S. Ide. The valiant efforts made by the few over the previous couple of years had brought enough time to save the range. This wooden hut was now 100 years old, and starting to need more than just a lick of paint. The summer was approaching and work needed to be started straight away. 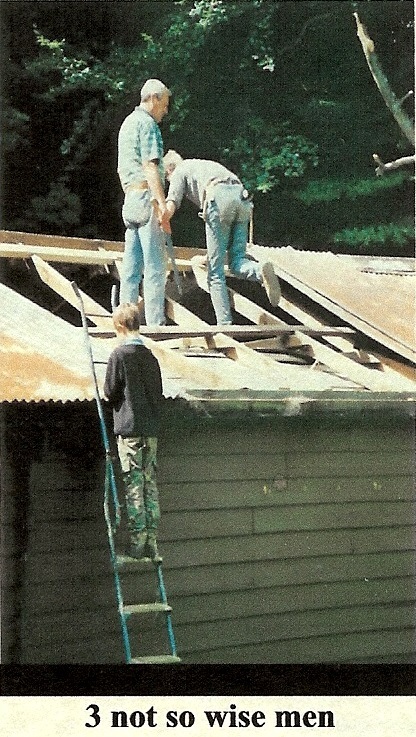 So during the summer of 2002 the entire corrugated sheet roof was removed, all the rotten wooden replaced in the joists, which had been originally nailed together, were now screwed together tight using 1500, 10 x 3, coated screws. The tin was then replaced, all the holes patched, then bitumen varnish sprayed on, and the finally, a non-setting roofing solution was applied over the whole roof. The exterior walls were sanded down, and again rotting timber was replaced. The planking boards were of such width and length that they could not be sourced in the time available, so ” exterior plywood was used to replace the bottom planks. When all this had been completed it was given 2 coats of exterior wood preservative; then all we had to do was wait for the rain. Winter came and went and the inside of the range was now dry, but still very cold from mid-autumn (fall) to late spring. With summer fast approaching again, plans were drawn up for the repairs and refurbishment of the inside of the range. New electric cabling, to replace the old lead sleeved cable, along with new lighting at the butts and throughput the building. The butts were over hauled and the firing point and club room were given a suspended floor and a coat of paint. The firing point also had a new curtain, and the club room had one wall papered, this ran across the ceiling at the entrance, this gave a more welcoming appearance when you came through the door. The work undertaken by the committee will now, hopefully, pay dividends as the club is warm and dry, and a nice place to be. None of the work could have been completed without the help of others, Churchley Bros. who supplied a lot of materials at very competitive rates, Coles of London, who donated the wallpaper and paste, Worthing & West Sussex Small-bore Rifle Assoc. for their cheque of £500, in advance payment for use of the outdoor range for the next ten years. All the shooters who paid their subscriptions to belong to the club, but only use the outdoor range foe shooting. Special thanks to Ms. A. Wilton for making cakes, sandwiches and numerous cups of tea and coffee, and also joining in with the general work along with Matthew Wilton, who from the age of 6½ has been a most helpful labourers assistant. Well in these uncertain times at the start of the 21st century, it is difficult to say. The only thing that appears to have changed is people’s attitude towards shooting sports. There are still wars being fought, for various reasons, and we still need soldiers to fight in them and shoot straight, fast and accurately. Much like the start of the last century! In a slow but relentless move, successive governments are steadily removing firearms from the legitimate sportsmen and women, but all the time we can carry on with our chosen sport, we will, and we will adhere to the philosophy outlined by Mrs. Mounteney Jephson over 80 years ago. We will try to teach the young responsibility, a sense of duty, so that if the need arises, which we hope it never does, they will be sufficiently equipped to undertake that duty should they choose to do so. The club membership now stands at a healthy 62 members, and with the refurbishment of the range now complete, I feel we will be able to encourage more people to take up this demanding sport. Even if we cannot, it is up to all of us to ensure that future generations have the freedom to choose their sport, and law abiding members of society to have firearms for the pursuance of that sport. This is a living document and should any new information arise or come to light, the relevant details will be changed or added. It was with deep regret that we, the custodians of the club missed out 100th birthday, but we will be having a bit of a do for the 100th anniversary of the affiliation to the N.S.R.A. I do hope to see you there! Sean Ide, Honorary Secretary, 2002 – ?